Judge Holly Trexler Wins Ten Year Term! Our innovative direct mail coupled with Communication Services’ political management team of Libby Post and Sheila Healy shepherded Judge Holly Trexler to victory in the seven-way primary for Albany City Court Judge. Appointed to the bench after an arduous interview process, Trexler had to run for a full ten-year term. 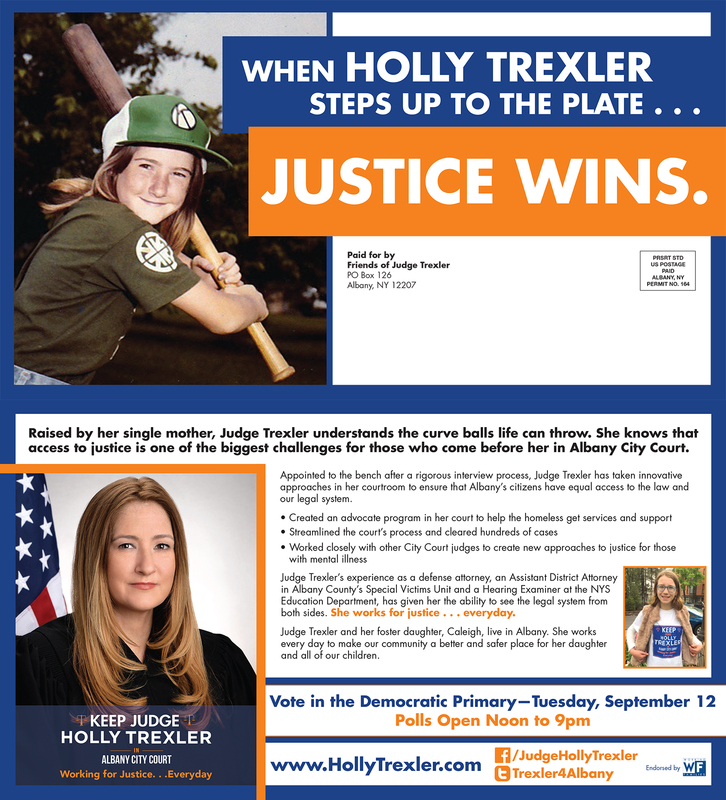 Running for one of three open seats, we branded Trexler as the “justice” judge. Every piece of literature, every Facebook post, every video (for Facebook, YouTube and broadcast) reinforced that keeping Trexler on the bench meant keeping justice in the court. The field operation was a combination of phone banking and door-to-door. A small, but dedicated group of volunteers took to the street throughout the summer talking to prime, Democratic voters about Holly and asking for their support. When Primary Day, Tuesday, September 12th, came, the campaign was ready with GOTV (get out the vote) calls to identified voters, a TV ad the four days leading up to the vote and targeted Facebook ads of two key videos–the TV ad as well as an endorsement video. When the votes were counted, Judge Trexler won the Democratic primary as one of three Albany City Court judges with 5,103 votes–just 172 votes shy of first place. In Albany, NY, if you win the primary, you’ll win the general election because of the astounding enrollment edge for the party of blue! Judge Trexler will be on the ballot in November without any significant challenge. She’ll be sworn in for a full 10 year term on January 1, 2018. After the November 2016 election, Vicky Plotsky heard the clarion call for more women to run for office. She decided to throw her hat in the ring for the Democratic nomination for the Albany County Legislature’s 38th District. Communication Services branded her campaign and created materials and direct mail for her race. The seat was up off cycle. Hon. Michael Mackey, now a New York State Supreme Court Justice, had previously held the seat. When he won his judicial race, the Highway Superintended for the Town of New Scotland Darrell Duncan was appointed to the County Legislature. Plotsky saw the opportunity to run and she took it. Spurred on by the support of local women electeds such as Albany Assemblywoman Patricia Fahy and the area’s new political action committee, CapitalWomen, Plotsky walked, called, mailed and even did two opportunities to ballot (write-in effort for the Independence and Conservative lines to make sure her November Republican opponent was denied both). When all the votes were counted, Plotsky’s field operation and mail launched her to victory–and not a squeaker. She easily defeated her opponent, Duncan, 281-77 (70.6% of the vote). Congrats to our clients on their electoral victories.